Earl Grey is my new favorite tea for making kombucha. While the tea is just a black tea blend, it’s the addition of bergamot orange oil that makes it especially lovely. Bergamot is a particularly fragrant citrus fruit from the Mediterranean which is used in most perfumes as well as a flavoring in marmalade, liqueurs, cosmetics and preserves. The combination of the hallmark kombutha tang with bergamot makes for a pleasant concoction. Bring water to a boil. Add tea and allow to sit until the water cools to room temperature. Strain the tea, add the sweetener, stirring to dissolve. 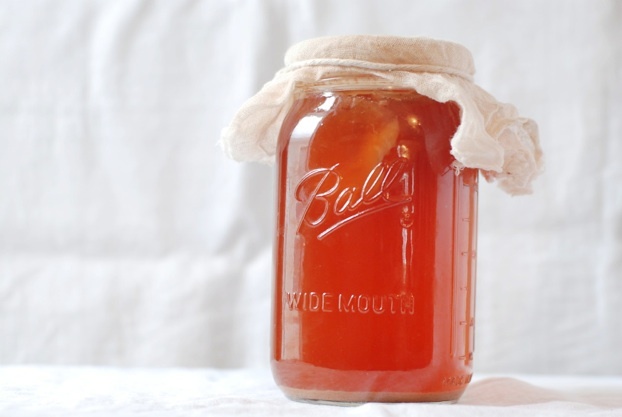 In a quart glass container, add the mature kombucha from your last batch or from a bottle of store bought plain kombucha, the kombucha mother, then add the tea and sugar mixture. Leave at least a inch of air space at the top of the jar so the mother can breathe. Cover the jar with cheesecloth fastened with a rubber band or string. Allow the tea to ferment for one to two weeks, tasting as you go until it reaches your desired level of sourness. When the kombucha is ready to drink, you have a few options. – Leave the kombucha in the glass container with the mother inside and drink as desired. It will get more sour longer it sits. – Make a new batch with the mother and ½ cup of the liquid. – Decant the kombucha, start a new batch immediately, and refrigerate the remaining kombucha to slow down the fermentation process, which preserves the level of sourness. – Carbonate your decanted kombucha by adding a teaspoons of sugar to the batch, placing it in a bail top bottle and let it sit out at room temp for another week. Refrigerate before opening so the bottle doesn’t overflow, champagne-style. Sourcing notes: If you are in need of a mature kombucha mother, you can order a dehydrated one from Cultures for Health or other online retailers, or ask your friends if they have an extra. They grow fast so most home kombucha makers have many to spare. For the mature kombucha liquid, use some from your favorite bottle of store bought kombucha, or from a previous batch.